Large speculators continue to expect weaker oil prices. EUR/USD gross short positions remain at extremely elevated levels. 10-year speculators continue on-going short-covering theme. According to the latest Commitment of Traders (COT) report, large speculators continue to expect weaker oil prices, reducing net long positions for the 10th straight week. While overall positioning has been consistently falling for months, the only silver lining in the latest CFTC report is that gross shorts only grew modestly and have seemingly stabilized. FX speculators continue to favor further dollar appreciation as positioning in EUR/USD futures remain at extremely elevated levels in terms of gross short positions. 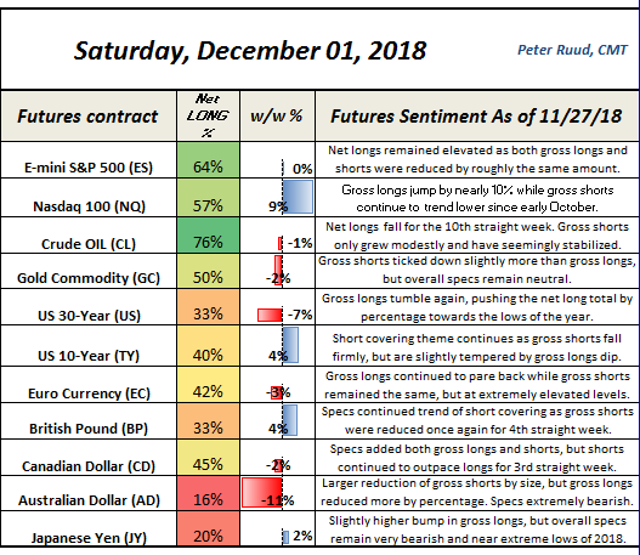 While net positioning has fallen consistently over the past few months, it was the dip in gross longs while gross shorts held steady that led this weeks decline to a fresh 2018 low in net longs. Equity traders appear to be relatively optimistic as S&P 500 net longs continue to hover near highs and Nasdaq 100 gross longs leapt by nearly 10%. 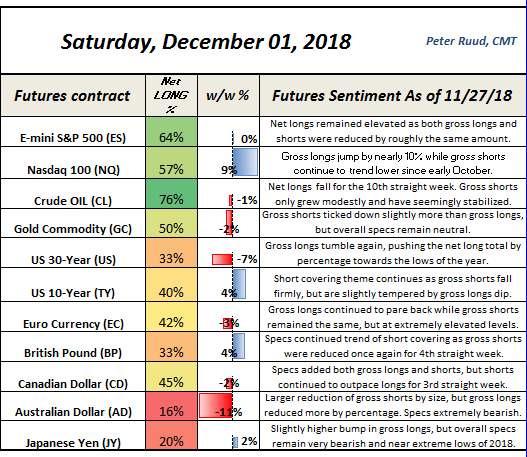 Net longs in S&P 500 futures remained elevated as both gross longs and shorts were reduced by roughly the same amount. Meanwhile, since early October, Nasdaq 100 gross shorts have continue to trend lower. Lastly, treasury speculators continue to point towards curve steepening as 30-year futures positioning continue to diverge in recent weeks with 10-year positioning. 30-year net longs have turned lower the past few weeks, reaching the extreme low (33%) seen back in early October. This is occurring while 10-year speculators continue an ongoing short-covering theme over the same time period.